The Burnt Ridge Quad is 6100 feet in length with 1432 foot vertical and it opened ten years ago. It serves basically 2 trails, Sagamore, which leaves you at the lift and, Echo, which ends 1/2 mile from the lift leaving you on a cross country trail.That is the definition of an underused asset and bad management. Look at what Hunter is doing right now with the new North Pod. A new lift, three monster trails that leave you right at the lift, plus 2 more access trails and all in one summer, not 10 years so far and who knows how much longer. Burnt Ridge should have at least 5-6 trails including at least an easy blue from the top. The good news is the Burnt Ridge HSQ will never need to be replaced since it is barely used. Maybe that was the game plan all along. So you're advocating the destruction of Barkeater? Yes. As much as I love the glade, it is low altitude and if it does not snow, Barkeater does not exist. You can not have a monster HSQ serve 2 trails for 10 years (unless you are ORDA). Just to clarify, I do not think local Gore management is bad, they can only deal with what comes out of ORDA. Excuse me - who is Mr ORDA? For once we have to consider that Sno may be right, this just adds to the pressure to make snow. It seems each year Sag gets open later and later and with crappier conditions. Frankly I could care less- what I hate to see is for them to pop over the ridge and start usurping terrain near lower Pete Gay and Raymond Brook. I understand the kind of thinking that says BR has to be developed. It's certainly "logical." From those drawings it looks to me like Cirque and the Ski Bowl glades are on the block. It also looks to me like Twister Glades live on. I don't see some of the other stuff Mike mentioned. Much of what is on that plan has been on there since the expansion. Just because it is on the drawing doesn't mean it will happen. Barkeater was drawn as a trail on the first drawing of the expansion and I do think that will happen. You who whine about skating Cedars? You need to STFU, this is being done for you. I love BR the way it is, a beautiful unique part of Gore. Gore has a huge percentage of the great inbounds tree skiing in NY, and it looks vulnerable. Like I said, I get it. But I don't like it. I'm with snoloco on this one, don't blow out any more glades until you can get the ski bowl open by Christmas. I've been doing some reading, they need to gouge the trails open to hit their cap of 40 miles of trails, what the Charter allows them to max out at. Double check the hatch patterns on the long term plan. I'm not going to say anything else about this, other than that last year they blew snow on 46er headwall and never even opened the trail. Its like putting an addition onto your house when the existing house is falling down. If you can't maintain what you already have, why bother expanding? Also, look at the utilization stats. Over the last 10 years, with Burnt Ridge, Ski Bowl, etc. added, the numbers are fairly flat. It's not like all this development is bringing in hordes of skiers. Logical? Gore/ORDA installed a 6100 foot, multi-million $$ high speed quad with an intermediate pitch and, in their infinite wisdom, cut only 2 trails, called them most difficult and let the decade go by without adding a true intermediate trail. The terrain on Burnt Ridge could probably even handle a green trail. But instead, they kept it an underused expert area with a built in excuse not to open it as it serves so few skiers and needs so much snowmaking to open. Never forget that plans at Gore have very little meaning, especially since there is no rhyme or reason to the financing at Gore. Wow. Can you be more obtuse? It is 7/10 of a mile hike (on a work road) from the main base to the base of the Burnt Ridge HSQ. Nothing like a big FU to snowboarders and parents with little kids. The majority of the people at Gore are not free heel, they are downhill skiers and snowboarders. It is almost impossible to buy tele gear now and I doubt there are many people on AT gear skiing at Gore. Burnt Ridge was always supposed to have more trails. 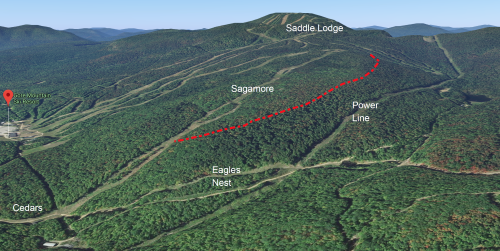 The half-assed way Gore adds snowmaking and trails (Ruby Ridge?) is responsible for this mess. At a properly run and financed ski area, there would be real financial decisions made to ensure an orderly expansion that includes trails, snowmaking on the trails and increased snowmaking capacity to get the water to the trails. The continued lack of snowmaking pump capacity continues to hamper snowmaking decisions. Yes, it's logical to build more trails around a new $7m lift. I think we both agree on that. I'm not responsible for timing of the funding. I put logical in quotes because even though it all "makes sense" I wish it wasn't so. Yes I think if you don't like the skate on cedars, then you should be happy they are putting in trails where glades currently exist. I don't mind the skate and I like the trees. I'm actually ok with giving up Cirque. Of the four awesome glades on Burnt Ridge to me it is least awesome. It's hardest to keep covered. I think we agree on snowmaking. Need more before you add more trails. I looked up obtuse. Ouch! I believe they are increasing water & pump capacity by 42% (or something like that). This should (in theory) help expand snow making, IF (thats the big if) they can hire enough trained manpower to cover additional territory. I guess what is confusing me is improving access to Burnt Ridge. A) Traverse in on Cedars. B) Cut in off Twister via Echo which is difficult most of the winter due to racing. All the improvements they are planning will not change access. 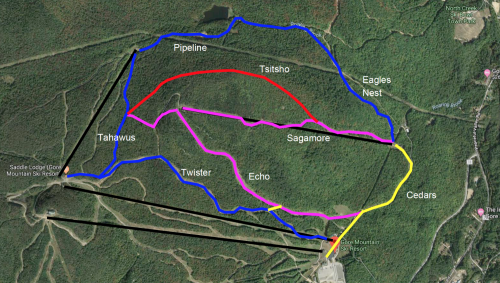 So if they wanted to do something smart, they would cut in a new trail that tracks the topography off Tahawus and swings through Tahawus Glade, through Abenaki, Barkeater and Boreas which will land you on Sagamore just above the last headwall. This would create a nice clean and easy skiing trail from The Saddle Lodge, straight into Burnt Ridge that would by-pass Twister and Echo, so the racers can do their thing. Eliminate the need to use Cedars, and vastly improve the Burnt Ridge experience. Instead of wasting all that money replacing the Hudson Chair, spend it on replacing the North Quad, which is too slow and inconsistent to support the volume it experiences. It is a perfect candidate for a detachable quad because it will get you up to the Saddle in a hurray, and be easy for beginner and novice skiers to handle. Since I have nothing better to do on a Sunday night, I put on my land use planner hat and mapped out a new trail, named it "Tsitsho", after the Mohawk word "Fox", because this would be a very sly way to enter Burnt Ridge. Burnt Ridge Ridge Mountain Satellite view with new trail highlighted in red. Burnt Ridge Mountain with new trail highlighted in red.